Usually a cracked tooth will cause you to experience some pain and discomfort which can be ranging from mild to intense. This is due to the fact that exposed pulps are irritated due to the external causes. If there is no action done to it, it may be too late for the most conservative treatment and you may require root canal treatment to treat it. However, do take note that there is superficial crack that is not causing pain at all. It is best to consult dental professional to assess it and do the necessary treatment. Depending on the type of crack, your dentist may do the following treatment to treat it. If the cracked tooth is very severe to the point that extraction is the only option available, Casa Dental offers you the option to replace the extracted tooth using dental implant. We do not encourage you to leave the gap without replacing it as it may cause the other teeth to move and cause other problems to appear in the future. Besides helping to fill up the gap between teeth, dental implants also help to prevent jaw bone from receding. If the crack caused the internal pulp to be exposed, simple treatment will not be enough to treat it. In this case, you may need root canal therapy. This is a procedure whereby the pulp inside the tooth is cleaned and disinfect before replacing it with special material. 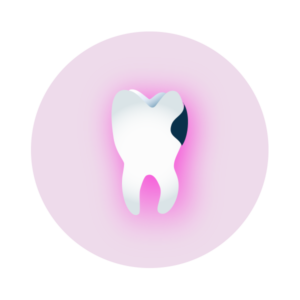 If the crack caused part of the tooth to chip beyond repair, but not to the extent that the pulp is exposed, crown may be the option that you may consider. Crown is a large cap that cover the entire affected tooth and shaped like your own tooth and color.cedure whereby the pulp inside the tooth is cleaned and disinfect before replacing it with special material. Some crack may cause tooth to lose a significant amount of its structure. Inlays / Onlays are permanent restorations that are used to rebuild tooth. Unlike dental fillings which can be done directly on the tooth, inlays/ onlays needs to be fabricated in dental lab before cementing it into place. It is pretty natural that you feel some discomfort during dental procedure, however here at Casa Dental, we strive to minimize as much discomfort for our patients so that you will have a pleasant experience in getting your new teeth.